If your travel plans do not include taking your snoring problem with you your next business trip or vacation, you can greatly benefit to switching to a SleepRight’s travel-sized snoring pillow. Though somewhat smaller than its full-sized counterpart, this travel pillow packs many of the same features into a smaller package that is easier to take on the go. The SleepRight Pillow has very special features that will provide ultimate support to your neck no matter what position you are sleeping in. 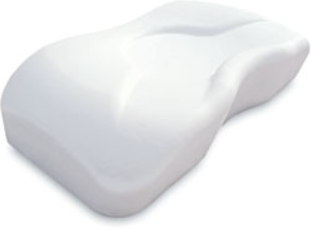 It is designed to cradle your head when you are lying on your side or back, providing ideal support for whatever position that suits your tastes. If you are a side sleeper, the pillow works by reducing pressure on your ear and jaw. This generally allows your face to relax and cradles it with just the right amount support. At the same time, you will feel maximum comfort. The SleepRight Pillow – Travel also allows for a 12 degree shoulder cradle, which is necessary for just the right level of alignment of the spine while you are sleeping. Your head and neck are properly supported by the special nooks in the pillow and the memory foam construction easily conforms to your individual body shape. If you sleep on your side, you also get a reduction in the amount of weight that rests on your shoulder, which allows for better blood flow in your arms. All in all, the SleepRight travel pillow is an excellent way to take the comforts of home on the road.